Bruce Morgan age 80, of Manchester, passed away Thursday November 22nd, 2018 in Salyersville, KY. He was born September 1st, 1938 to the late Monroe and Mildred Morgan. He leaves his wife of 33 Years, Josephine, his daughters Gerry Lou (Terry), Amanda (Neil), and Tina (Gary), son Charlie and is Preceded in death by one son Pap (Patty). 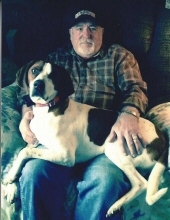 He has 10 grandchildren, 12 great grandchildren, and one great great grandchild, two sisters Vivian and Shirley Jean and one brother Everett and his loyal companion Jack. He joined church 18 years ago and has been a devoted christian ever since. He was the type of man to help anyone that needed it. He was loved by many more than he ever thought he was and will be greatly missed by each and everyone of them. He started working at the early age of 15. He did alot of different jobs in his lifetime but he really enjoyed running heavy equipment. He had lived many different places but came back home to retire on his family's farm here in Clay County. He will be taken to Salyersville, KY for his final resting place on the Goble Jenkins Cemetery. The funeral service for Bruce will be held 11 AM Monday November 26th, 2018 at the Britton Funeral Home Chapel with Edward McFadden and David Davidson officiating. Visitation will be after 6 PM Sunday November 25th, 2018 at the Britton Funeral Home Chapel. To send flowers or a remembrance gift to the family of Bruce Morgan, please visit our Tribute Store. "Email Address" would like to share the life celebration of Bruce Morgan. Click on the "link" to go to share a favorite memory or leave a condolence message for the family.